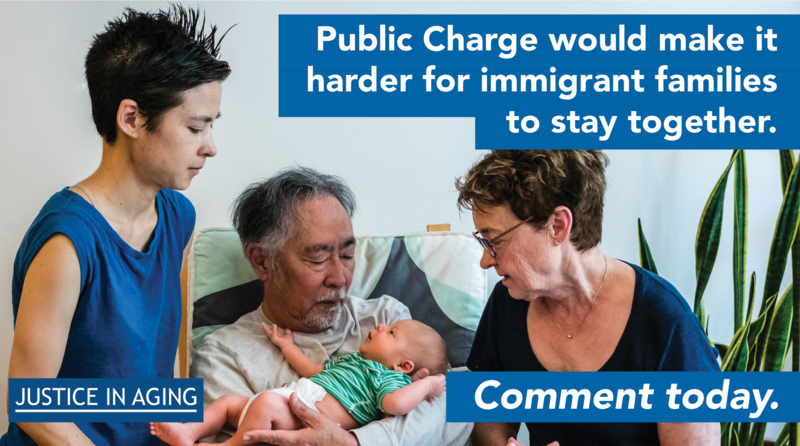 “Public Charge” would make it harder for immigrant families to stay together and meet their basic needs. By targeting low-income immigrant seniors who may need extra help from programs like Medicaid, the Medicare Part D Low-Income Subsidy (“Extra Help”) or the Supplemental Nutrition Assistance (SNAP), changes to public charge would ensure that the American Dream is only available to immigrants who are healthy and wealthy and who do not have disabilities. 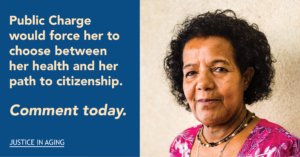 If the public charge rule is enacted, it would threaten the ability of immigrants to obtain permanent residency (green cards) if they have ever needed help, or were likely to need help, from certain government programs and make it difficult for multi-generational families to care for one another and succeed. The Public Charge rule is open for public comments until December 10, 2018. We encourage everyone to use the Justice in Aging resources below to help you comment on the rule’s particular impacts on older adults and caregivers. Justice in Aging worked with the Center for Law and Social Policy (CLASP) to present a training on public charge to advocates for older adults. 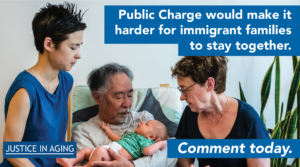 The webinar offered an overview of the existing public charge rule and key proposed changes, including the addition of certain government benefits older adults rely on, and details on how immigration officials make the public charge determination. Watch the webinar for tips on how you should be counseling your older adult clients and what you can do to fight back against this harmful proposal. Looking for resources specific to the disability community? The Consortium for Citizens with Disabilities created a number of resources on the rule’s impact on people with disabilities. They can be accessed here. Download and use the older-adult focused Public Charge graphics below and use the hashtag #ProtectFamilies when posting. Follow @NILC_org and @CLASP_DC and visit protectingimmigrantfamilies.org to learn about more partners in this effort.